2 Bedroom Terraced House For Sale in Manchester for Offers Over £125,000. 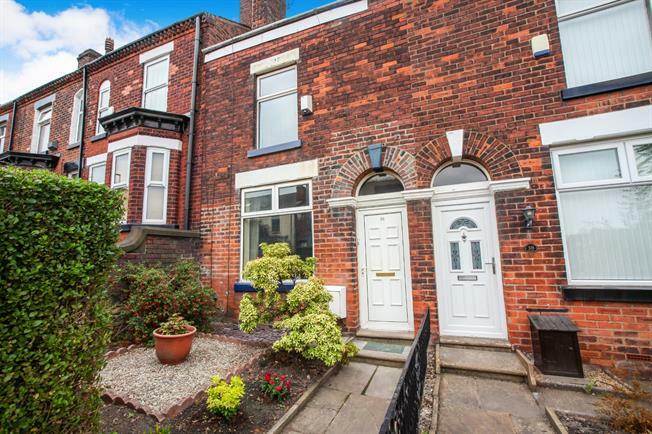 Offering incredible space throughout and full of original features, this period terrace is ideal for first time buyers or buy to let investors. Centrally located and offering two great size reception rooms, a fitted kitchen, two double bedrooms, fitted shower room and a fully boarded loft room with a velux window. In need of some cosmetic modernisation, yet benefitting from a modern gas central heating system and double glazed windows throughout. Externally there is a front garden and to the rear an excellent size garden with patio seating area, artificial lawn and gates providing off road parking. Hardwood front single glazed door. Radiator, carpeted flooring. Double glazed uPVC window facing the rear overlooking the garden. Radiator and gas fire, carpeted flooring, under stair storage cupboard, dado rail and stairs to first floor. UPVC back double glazed door, opening onto the garden. Double glazed uPVC window facing the rear overlooking the garden. Tiled flooring, part tiled walls. Roll top work surface, wall and base units, stainless steel sink with mixer tap and drainer, integrated electric oven, integrated gas hob, over hob extractor, space for washing machine and fridge/freezer. Pull down ladder to access attic room . Radiator, carpeted flooring. Double bedroom; double glazed uPVC window facing the front. Radiator, carpeted flooring, over stair storage. Double glazed uPVC window with obscure glass facing the rear. Radiator, tiled flooring, built-in storage cupboard and boiler, tiled walls. Low level WC, walk-in shower, pedestal sink. Double glazed velux window facing the front. Built-in storage cupboard.